Tax season cometh whether you like it or not, but doing your taxes is not the horribly tedious task it once was now that you can easily file online. If all your income was from one company (as opposed to a freelancer or consultant with contracts from more than one company) and you don't own your house, don't have dependents, and otherwise have a pretty straightforward financial life, you will most likely be able to do your own taxes without a struggle. More than 27 million taxpayers have already filed their taxes for 2013 from home computers, in a process known as e-filing. According to US News and World Report, you can save up to $100 if you choose to do your taxes yourself with tax software versus going to a tax store. Even individuals who are not eligible to file for free (anyone who is of $58,000 or less can use Free File, and those with higher incomes can use online fillable forms, the digital equivalent of filing on paper) can save a considerable amount of time and money doing taxes online themselves. Check all of these documents for errors like incorrect year, name, address, or inaccuracy in how much you were paid. If you find an error, contact the company and ask for a corrected document. Free File: This government-run service provides referrals for free federal tax preparation (remember you will also have state filings). The listings, provided by the IRS, display companies and services that meet the IRS’s standards for filing. In all, you can choose among 14 different tax preparation services to prepare your federal taxes for free if you meet certain income, age, or location qualifications. TaxACT: This offers the Free File option to taxpayers who made $52,000 or less and fall between the ages of 18 and 57. Filers in 19 states and the District of Columbia can also prepare and file state returns for free; otherwise they cost $14.99. H&R Block at Home: You can do basic tax prep for free (even with an income above $58,000) and get a lot of the same benefits as a paid user of the service. There is live help available from tax professionals, which can be especially useful if you get audited (FYI your odds of getting audited rise as you make more money. If you have an income of between $25,000 and $100,000 your chances of getting audited are less than one percent. The free online version includes e-filing at the federal level but state e-filing will cost $36.99 per state. TurboTax: This is another great basic tax service (and who doesn't love their commercials?) Turbo Tax is the largest online tax service in America and offers five levels of service, with federal returns running from free to $75 and state returns from $28 to $37. The directions are extremely straightforward — they basically ensure you can't mess up. It offers error-checking, immediate access to live tax professionals and it will make you get the biggest refund possible. Plus, if you do find your taxes are complex and you need additional services, you can very easily upgrade to the paid service and all your information is transferred over so you won't have to start from the beginning. Like everything, you have to be careful when filing online. Because it is so easy to file online, plenty of cyber criminals try to file fraudulent tax returns. Last year $3.6 billion worth of fraudulent claims were filed. So what can you do to protect yourself? Watch out for suspicious emails: Look out for ones that claim to be the IRS wanting access to information like your Social Security and your address. Use a different password: Don't use that same password you use for everything from Facebook to HBOGo and have had since you were 16. Be careful on social media: Sharing more personal info makes it easier for cybercriminals to pose as you when filing. 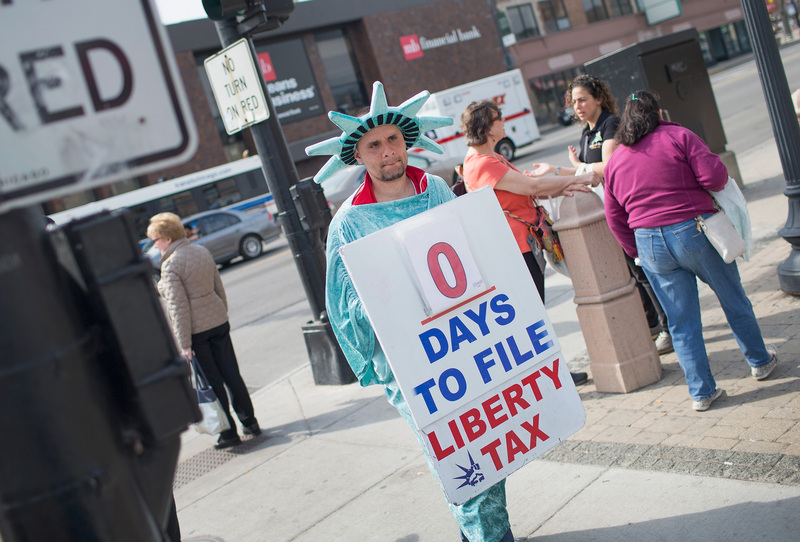 Don't file your taxes in areas with free Wifi: Maybe don't go to a Starbucks to file. A free Wifi connection can be intercepted by cybercriminals. Now you are ready to file your taxes. If you have that simple straight-forward income you may be able to finish in under an hour. Happy filing!